We offer a great range of 4 and 5 piece bathroom suites in modern, trendy styles which are made to the highest quality. 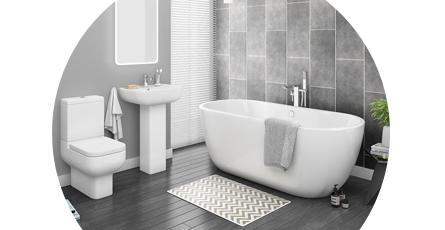 The majority of our modern bathrooms are in stock and available with next day delivery too. Our stunning array of modern bathroom suites takes the 4 piece option and adds other items into the mix such as bathtubs, showers and taps. This enables you to completely transform all your fixtures in one go. One of the most effective ways to overhaul a dated looking bathroom is to refresh it with a contemporary suite. Our popular range of modern suites includes designer bathroom suites for those who are looking for the latest designs.